Some creative people have a reputation for being “out there,” as they may express very intangible ideas that may not be easy for non-creatives to understand. But anyone who knows Jayne Vidheecharoen knows that’s not how her brain works. The design director for ArcTouch enjoys removing the ambiguity from ideas and making them real. “I think a big part of being an effective designer is being able to help other people make sense of abstract ideas and turn them into reality,” she says. That pragmatism has translated to dozens of successful app user experiences and UI designs she’s created in her four years at the company. Outside of the realm of digital, she’s as much a builder as she is a “designer.” She once created a mini-golf hole for a food truck park, and she recently took a class in shoe design. 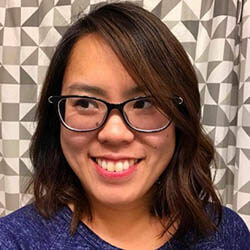 We sat down recently with Vidheecharoen (which, as she explains, sounds a lot like “we teach, ya learn”) to talk about her work as ArcTouch’s design lead — and how her practical approach to design applies to her work and life. You once made a kit to help teenage girls to learn design. You’ve built a mini-golf hole for a food truck park. And you’ve even learned how to make shoes. So, are you always designing things? Yeah, I think I’m just curious about how things I like (or don’t like) are made and the process that goes into it. The best way for me to understand and scratch that itch is to figure out how to make one myself. For instance, I’ve been really frustrated by how terribly uncomfortable women’s shoes are. I started wondering what it would actually take to make something better. So, I spent a week with an old craftsman in Washington learning how to make a pair of leather oxfords from scratch. I’m not sure what I’ll do with that skill yet, but maybe it’ll come in handy someday. So, no plans to become the next great shoe designer, a la Christian Louboutin? Um, no. But sometimes that curiosity leads to useful things. When I got my first iPad I was immediately fascinated by the apps there. Like many people, I wanted to learn how to make my own. I feel pretty lucky that I get paid to scratch this itch, and that in the past four years I’ve had the opportunity to help design more than 35 products. Not all of them have ended up in the app stores — some are proof of concepts. But every project is unique — and a chance to learn. Would you say you’re more of a visual designer or more of a user experience (UX) designer? I generally just think of myself as a designer since the things I work on are fairly broad. When it comes to app design, I prefer the label “product designer” because it feels more comprehensive and I think both visual and UX design are equally important. I probably lean a little more towards a UX mindset because I enjoy organizing large complex systems and finding ways to smooth out the experience. These days I’m actually not doing as much hands-on design though. My responsibilities have shifted more towards supporting and growing our design team, which I like to think of as a design challenge in itself. I’ve heard you’re a master at taking abstract ideas and turning them into very real designs and experiences. Yeah, I think a big part of being an effective designer is being able to help other people make sense of abstract ideas and turn them into reality. Often times, clients will first come to us with a very fuzzy notion of what they want. But the people building the thing need to know what they’re building before they start. I think I’m most helpful in the space between those two points. I don’t think app design needs to be a particularly complicated process. Honestly, it’s just about being a good listener, asking questions and making sure we figure out which questions we don’t have answers to yet. So, in those very early meetings with clients, how do you take something that’s fuzzy and turn it into a more concrete idea? Where do you draw your design inspiration from? From anywhere! For general art and design inspiration, I really enjoy the Colossal blog. And for weird art and technology stuff, Creative Applications. When we work on new projects, we do a lot of competitive research on similar products but also try to broaden our inputs and look at unrelated industries that might be doing something delightful or unique. I have admired Jonathan Harris ever since I started working as a designer, though I think of him more as an artist who also creates with technology. I have always loved his writing about the role of technology in our lives. I find myself frequently returning to his old essays about world building and modern medicine when I need to take a step back and reflect on my work. Describe your creative process when it comes to designing apps. How is the thought process different than other types of design? Designing interactive experiences like apps requires an appreciation for fluidity and unpredictability. We’re designing for variables, edge cases, error states, changing requirements, and APIs that are currently in development. And since most users are unpredictable, they’ll poke at an app in all sorts of random ways that we need to consider. Designing an app isn’t just about creating a thing that looks nice, but a system that’s resilient enough to adapt gracefully. With Alexa and the rise of personal assistants, designing for a voice user interface (VUI) is now an important skill. How is this different than visual design? Well, I think the trickiest thing about designing for voice interfaces is that the user can only interact with one stream of information at a time. One benefit of visual interfaces is being able to quickly scan a large amount of information. As a designer, you can use a variety of visual cues to help the user understand the hierarchy of information and what they’re able to interact with. The other thing that’s a challenge for voice interface design is in creating a really unique personality. It’s easy enough to create delightful scripts and responses. But the voices today tend to lean towards this generic, cheerfully agreeable and obliging professional European woman. I’m looking forward to a future where there are more diverse options for expression. Why did you come to ArcTouch? When I joined about four years ago the design team was quite small, with only two other designers. I saw an opportunity to have a greater impact on multiple products and to shape the role of design here as the company grew. It’s been really great to see how our design team has grown — now we have 15 design team members. When I started here, I also wanted to dive deeper in designing for mobile, but I wasn’t sure what industry I was most interested in — so the chance to work with a variety of clients was perfect. I was also excited about the fact that ArcTouch has so many talented engineers who would be able to actually build the things I designed. Aside from the variety of interesting clients we get to work with, the other thing that I’ve enjoyed is the high degree of autonomy and flexibility. “Work from home Friday” has always been a top perk, but I think more than that I’ve appreciated how open-minded ArcTouch has been in terms of experimenting with new ways of working together. Between design, engineering, product, and the client, our process and products are always evolving. Since technology moves fast we have to be able to quickly adapt. Ideas and suggestions can come from anyone in the company, regardless of your role or seniority. We’re working on a lot of interesting projects recently that I’m looking forward to finishing so we can start talking about them. But of the projects that we can talk about, one of the most satisfying was the EmployBridge family of apps. We did several rounds of in-person user testing during the initial design phase and it was really clear how helpful the app was going to be for the people who needed it. These apps make a huge difference to their lives — allowing them to easily find work. During the user testing, we also uncovered several common concerns among the job seekers, and we were able to build those into the first version. It’s also just great to know the app is helping so many diverse job seekers across the country find good jobs that match their skills.